"It's probably formed — and this is speculation — by the aggregation of small little bits of ice or in an initial big chunk of ice that, because of initial rotation, little pieces of ice glob onto it," Nakroshis said. As for why it rotates, Nakroshis says researchers have found melting ice sinks, causing a vortex that can turn the disk. "However," he adds, "the water in the Westbrook river is not actually warm enough to cause the effect. ... So most likely the cause of the rotation is just the river water going by the disk, and once it starts rotating in that direction it's probably going to continue." 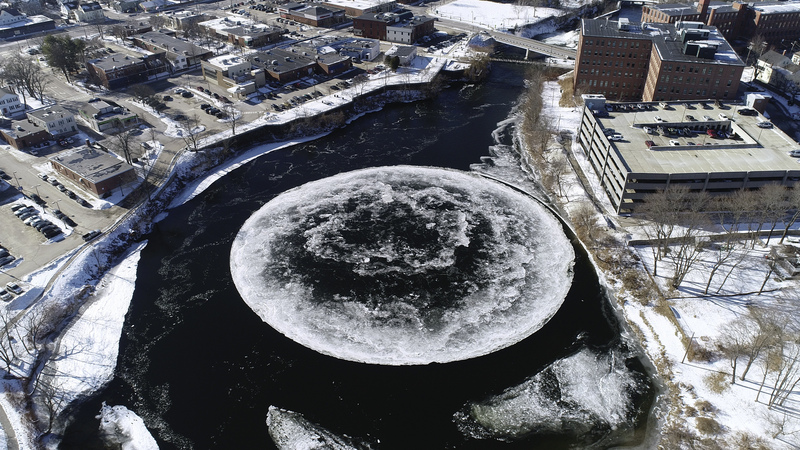 His best guess for how fast it is spinning is based on study of an ice disk that formed in a New York river in the late 19th century and did a whole rotation in about six minutes. The Portland Press Herald reports that the Presumpscot River ice measures about 100 yards across and is serving as a water cooler topic for area workers. Rob Mitchell has a bird's-eye view from his riverside office building and told the Herald he saw ducks resting on it Monday. "The ducks were rotating on this big Lazy Susan," he said. "It was a big duck-go-round." It may be terra firma for birds, but for people this disk is best seen and not stood or skated on. Nakroshis tells Maine Public Radio that a person could fall through. The city of Westbrook is taking a more celestial view of things on its Twitter account. "It looks like the moon has landed in Westbrook, Maine!" it tweeted. The city, located about 7 miles west of Portland with a population of fewer than 20,000, is basking in the sudden media glare. Good Morning America did a feature from its riverbank. And Westbrook's homegrown star is piquing interest across the pond. The city is hoping the frozen phenomenon will lure visitors before the inevitable warmer temperatures force them to let it go.